Monitoring and measurement of flatness on the production line. Vision system captures a wide range of defects arising during the manufacturing of cold-rolled grain oriented electrical steel strips (company product Surface Scan System). The system also includes flatness measurement (company product Shape Scan System). 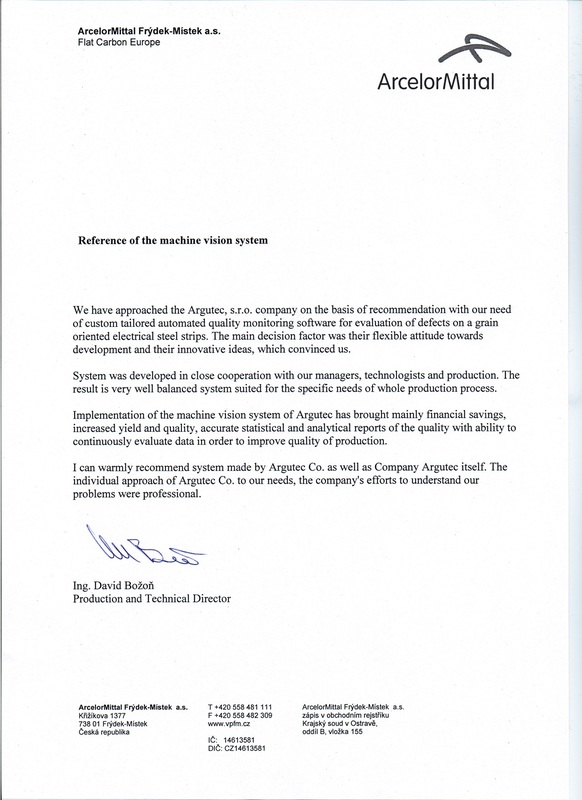 Vision system is supported by applications for statistical evaluation, data visualization, applications for subsequent production lines and other support software. System monitoring ratio of the slag and liquid metal when deslaging on tandem furnaces using thermal imaging cameras. Surface scan of hot rolled steel plates. Vision system captures a wide range of defects arising during the manufacturing of cold-rolled copper and brass strips (company product Surface Scan System). The unit for detection of atypical defect - height difference <0,01 mm. Examination of cracks in molded body parts. Counting and checking the orientation of the pieces in packages. Billet counting at the pusher furnace outlet. Development of electronics, firmware and analytical software for duralumin capsule and skid sensor for logging physical quantities while passing through the loose materials in reservoir. Development of metallurgical models for steel making in the converter and ladle furnace. Implementation of applications for operators. Operator applications communicating with production machines. Production machines load balancing optimization on basis of date of expedition, ordered products and materials needed for production. Europe-wide system for B2B suppliers and retailers of tires, disk and accessories, research and development of big data processing platform.